ROME, JULY 12, 2012 (Zenit.org).- After the incidents in the Catholic community of Con Cuong, Bishop Paul Nguyen Thai Hop of the diocese of Vinh and president of the Justice and Peace Commission of the Episcopal Conference of Vietnam, gave an interview in Paris to the Eglises d’Asie agency to comment on the incidents and other subjects. 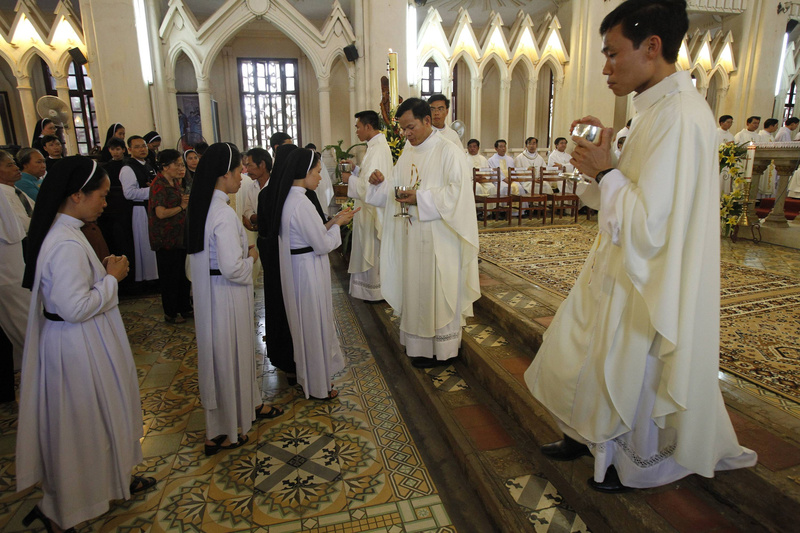 On July 1 what Asia News described as “a group of thugs linked to the Vietnam Patriotic Front,” attacked a group of Catholics gathered in a house of prayer in Con Cuong district – Nghe An province, Vinh Diocese, as they gathered to celebrate Mass on Sunday. It was just the latest in a series of attacks that started last November. The bishop spoke to the agency July 8. Q: What is the reason for the unleashing by the local authorities of such a wave of violence against a small group of believers who wished to celebrate the Eucharist? Bishop Nguyen Thai Hop: It’s true that all this seems inexplicable. One cannot understand the profound reasons of the authorities or the spirit that has guided their action. However, certain reasons can be put forth. In Vietnam there are districts called “heroic districts” [regarded as places of “Communist resistance”]. To preserve this status of “heroism,” they must follow three or four criteria. One of the criteria is the absence of religion and religious practices in the district’s territory. In fact, the district of Con Cuong, situated in the northeast of the province of Nghe An, forms part of this category of districts which have the obligation to perpetuate and preserve the tradition of heroism. One can think that this is one of the reasons for the brutality of the behavior of the authorities in this matter. One can also speak of a motivation of a political order, which would be plausible in today’s Vietnam. Christians have been present in the district of Con Cuong for a long time. 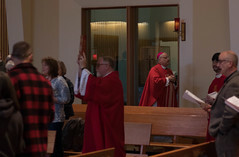 Beginning in 1970, priests came to the region to celebrate Mass and to help the minorities. 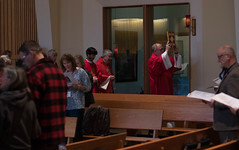 A priest goes regularly to the place on Sunday to celebrate Mass. We don’t understand why the authorities have intervened with such brutal behavior against the Catholic community of Con Cuong. Last year a mine exploded in front of the chapel. It was a criminal act. We protested but there was no reaction from the civil or police authorities. We want to live in dialogue with the authorities. We have no intention to use the matter of Con Cuong to impose our claims or slander the Party and the government. But the incident of July 1 is exceptional; it is intolerable for the majority of Catholics. The authorities have gone too far! As we say among ourselves, when certain limits are exceeded, we must react. Patience is a Catholic virtue, a human virtue. However, as everything that is human, it has its limits which cannot be exceeded with impunity. Such is the feeling of Catholics of our diocese. In a difficult situation what takes priority is solidarity with our Catholic brothers and sisters in our diocese. We don’t’ just want to protest, we also want to express this solidarity and ask for justice for the victims of this brutality. Q: Is the incident in Con Cuong completely isolated or are there in your diocese regions where incidents of the same sort could take place? Bishop Nguyen Thai Hop: There are three provinces in my diocese: Nghe An, Ha Tinh and Quang Binh. Two years ago, in Quang Binh, in the village of Tam Toa, there were violent incidents such as those in Cong Cuong. The violence, I know not why, has now spread to the province of Nghe An. There the intolerable incidents of Con Cuong have taken place. Fortunately, in the other provinces, there are no similar conflicts for the time being. In the last Christmas celebrations, a top government official came from Hanoi to wish us a Happy Christmas from the government and to express his own good wishes. Q: You preside over the Justice and Peace Commission created by the Episcopal Conference of Vietnam a year and a half ago. Bishop Nguyen Thai Hop: Indeed, our Commission began its mission a short time ago. In the space of a year and a half, we haven’t done many things, because of our personal limitations but also because the socio-political situation did not allow us to do what we thought and wished to do. We regard the spread and implementation of the Social Doctrine of the Church as a way of evangelizing the world. Pope John Pal II said: “The Social Doctrine of the Church is not the third way between capitalism on one hand and Marxism on the other.” Pope Benedict XVI has added that the Church does not replace the State in its functions, but that she could make her contribution and dialogue with the government with the objective of serving men. We must evangelize and serve the men of our time. Pope Benedict XVI has asked the Vietnamese bishops to collaborate and dialogue frankly with the State. However, our evangelical vocation obliges us to privilege what is in keeping with truth, what is useful to the service of the country and in agreement with human rights. That is why we are partisans of dialogue, a dialogue that is very interesting but that is far from being simple and easy. Q: The latest publication of your Commission is a report entitled “Considerations on the General Situation of the Country.” You mention the positive evolution of the country over the past few years especially on the economic plane. However, you stress numerous negative aspects of present-day society. Bishop Nguyen Thai Hop: Let’s look at the history of Vietnam over the last 40 years. From 1975 to 1990, the situation was difficult, especially in the 80s. At that time, there were many difficulties, especially for Catholics. Then, in the period from 1990 to 2008-2009, the situation changed. The policy of doi moi (change) little by little gained ground and renewed the country in all areas. This is undeniable. However, in these last years there has been a clear slowing down of progress. The civil society and the political society have also experienced a slump. It’s not that I’m a pessimist, but that the situation is bad. The socio-political situation is worrying. I’m not the only one who thinks this. That is why, for this report our Commission wished to make the voice of criticism heard, but a constructive criticism, desirous of seeing the country undertake the path of real development. Economic development must be linked to social and human development. Q: Today in Vietnam the battle for safeguarding Vietnamese sovereignty is supported by many people including the Catholics. You yourself have spoken about this several times. Do you think that this battle is part of your mission as a pastor? Bishop Nguyen Thai Hop: In the pastoral Constitution on the Church in the world of its time, Vatican Council II declared: “The joys and hopes, the sadnesses and anxieties of men of this time, of the poor and of all those who suffer, are also the joys and hopes, the sadnesses and anxieties of the disciples of Christ, and there is nothing really human that does not find an echo in his heart.” We are at the same time disciples of Christ and children of a nation; we are Vietnamese and Christians. Vietnam is the nation that God has given us to be really human, to be in it a citizen and a Christian. Hence, with the other citizens, Catholics, non-Catholics and also Marxists, we want to manifest our concern regarding the very dangerous situation for the country’s destiny. Q: The issue of religious liberty is in the report of the Justice and Peace Commission on the general situation of the country. Bishop Nguyen Thai Hop: We must acknowledge that the government has done much, both in favor of the Church as well as in favor of religion in general. If a comparison is made between the situation of the Church in Vietnam shortly after 1975 and the one that exists today, we can see that there has been much progress. Vietnam has entered the World Trade Organization, it has become a member of numerous international institutions, and is now obliged to implement international conventions on human rights. What is left is to arrive at the normalization of the situation in regard to religion. Currently a new decree on religion is being prepared. However, if the situation were normal, there would be no need for this decree. It is necessary to treat Catholics, non-Catholics, Buddhists and all others as citizens! We already have a civil code and everybody must be treated according to the law. I don’t say that this can be done all at once. But we must tend to this kind of situation. If we succeed, then we will be able to say that there is real religious liberty.